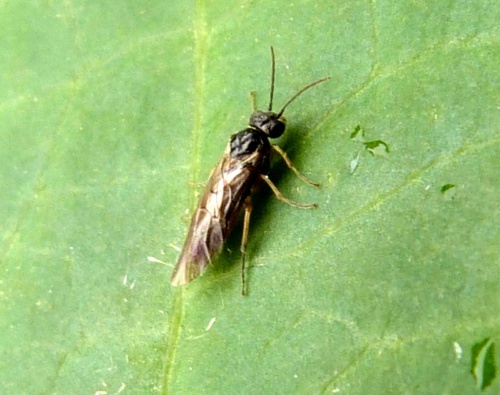 This very small, 3 to 4.5 mm long, rather inconspicuous species is mainly black above, however the legs are extensively yellow as are the sternites (the bands between sections of the abdomen). This gives the abdomen a slight black and yellow banded appearance. Often found where Blackthorn is present. The adults will visit Blackthorn flowers on warm sunny days. Larva feeds in the developing sloes on Blackthorn (Prunus spinosa). An infrequent species although it is possibly overlooked due to its small size. Rare or under recorded in Leicestershire and Rutland. The Sapcote record of 18th April 2014 is believed to be the first record for VC55.